I was in Glasgow getting a steroid injection into my right shoulder in clinic F then having a pint of blood drained from my left arm in clinic P when I heard the news that a parcel from Australia was waiting for me at my summer home on the Solway. 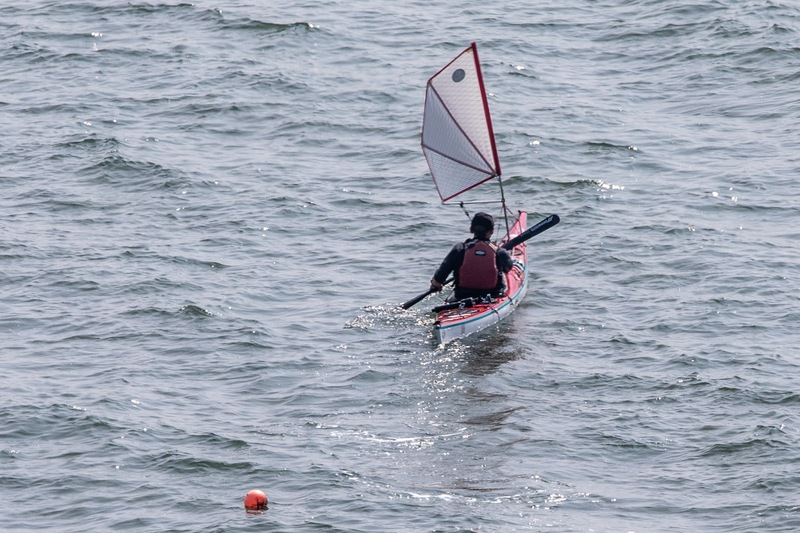 Despite living 50m from the shore for 7 months of the year I have not been very active recently. 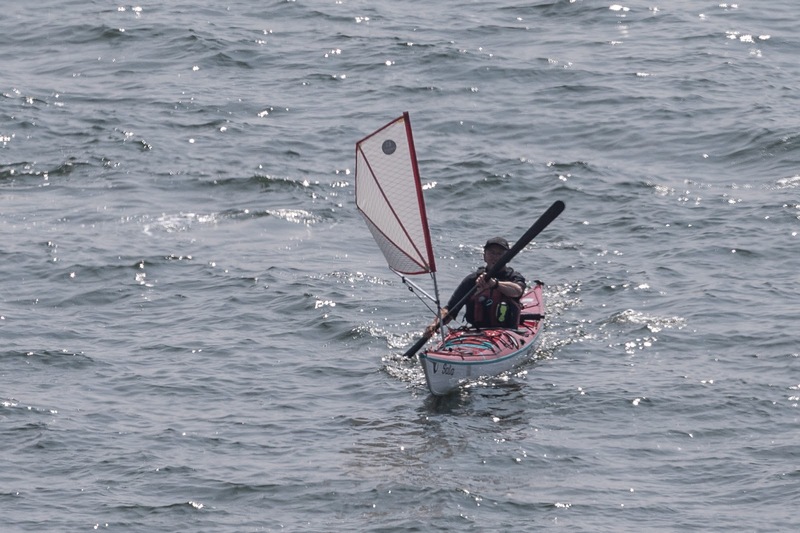 I last managed a kayak camping trip in May 2017 and have had to give up windsurfing. Since January 2017 I have lost 27kg not to mention over 40 pints of blood and 1.5" in height, so I needed a bit of a boost to get me back on the water! Well the parcel was, as expected, from Mark Sundin of Expedition Kayaks in Australia. They have taken over Flat Earth Kayak Sails following the sad and untimely death of Mick MacRobb who created Flat Earth. I was privileged to have tested prototypes of each of Mick's previous sails: the original all dacron, the dacron with mylar edges, the Code Zero and finally the Trade Wind. Each of these designs allowed a lot of twist in the leach which meant the sails would automatically spill winds in the gusts. This made them extremely user friendly, especially for newcomers to paddle sailing. I have no doubt that the international success of Flat Earth Kayak Sails was built on the sails' degree of inbuilt twist. This photo shows the twist in an early all Dacron Flat Earth sail. However, one disadvantage of twist is that paddling downwind in a loaded boat, when the windspeed is about 3 times or greater than the boat speed, the leach twists open permanently. This spills wind that might otherwise drive the boat forward. Also when going upwind, the loose leech tends to "motor" when going upwind. Even the most recent Trade Wind sail has considerable twist as you can see in this staged photo. The bow is directly downwind and there is about 90 degrees difference between the angle of the head of the sail and the boom. If there was zero twist, the head of the sail and the boom would be parallel. Each time I suggested to Mick that he should consider tightening the leach, just a little, he said that he was very reluctant to do that as he did not want to turn Flat Earth sails into "experts only" sails. Anyone who ever had any dealings with Mick would know that he was an egalitarian to the core of his soul. 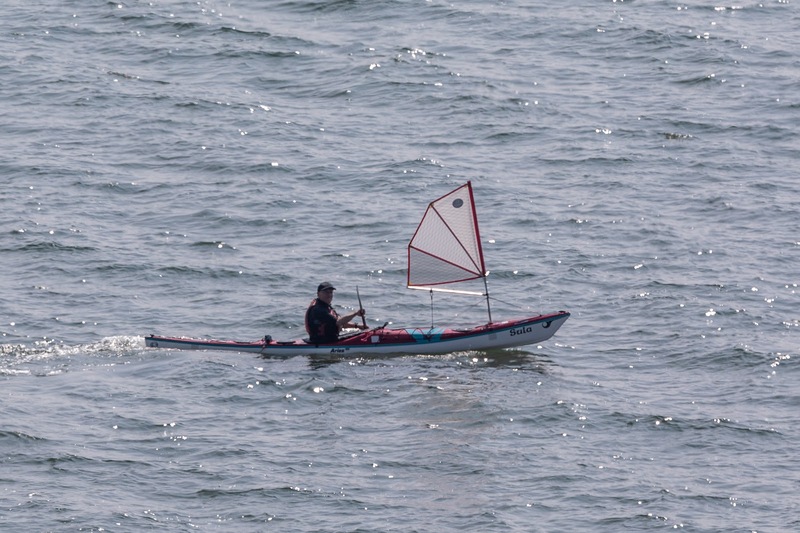 He wanted the Flat Earth Kayak Sail to be accessible to any reasonably competent sea kayaker. He would often give sails away to clubs or individuals who he knew could not afford them. So I was delighted to see that the Footloose sail's logo proudly proclaimed "Designed by Mick MacRobb". In truth many people have influenced the production of this new sail and modest as always, Mick was the always the first to acknowledge the input of others into his previous designs. 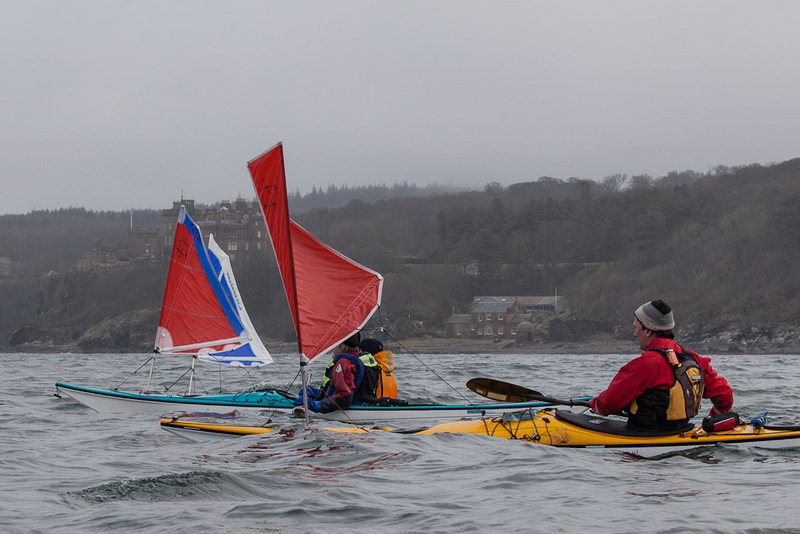 Back in May 2016 Tony and I were crossing from Rum to Eigg in the Scottish Hebrides. 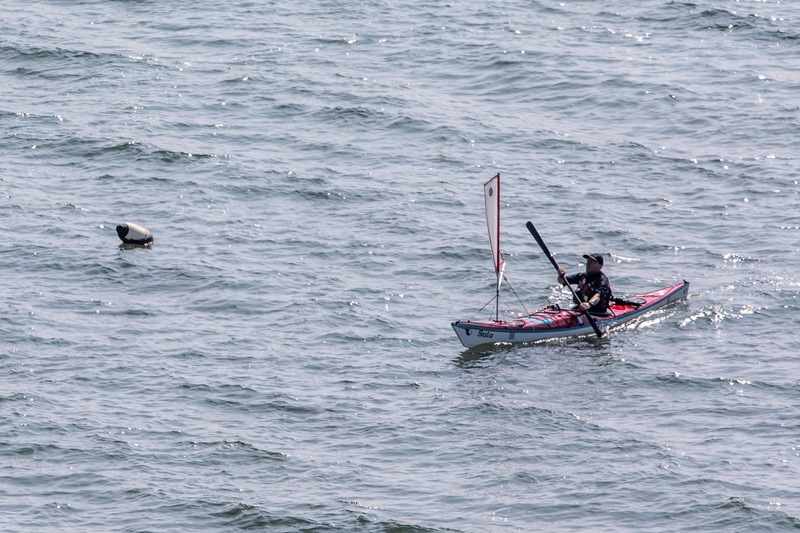 We were on a broad reach in a fresh wind and were fully loaded with camping gear. I found the degree of twist just a little frustrating as our sails were constantly spilling wind. So when I got back, I tried another tack with Mick. 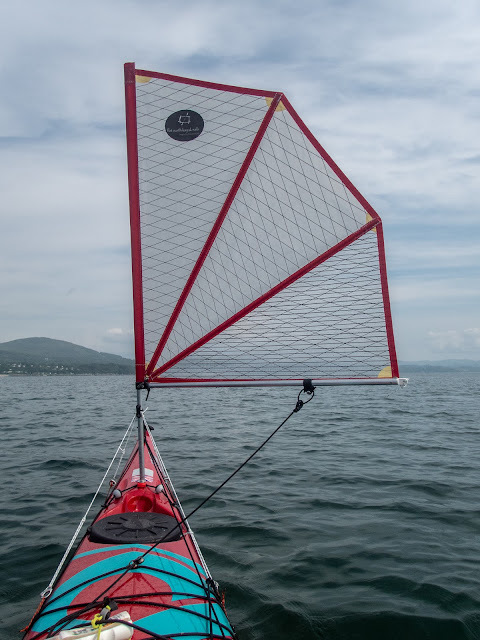 I suggested that perhaps the time had come for Flat Earth to create an additional new sail for for more advanced users, which would be sold alongside the current Trade Wind sail. It could have a tighter leech, perhaps with an extra batten. I got a reply, almost immediately. In it Mick said he had been feeling a bit tired of late but he had already had talks about this with his mate Rob Mercer (a renowned Australian sea kayaker). 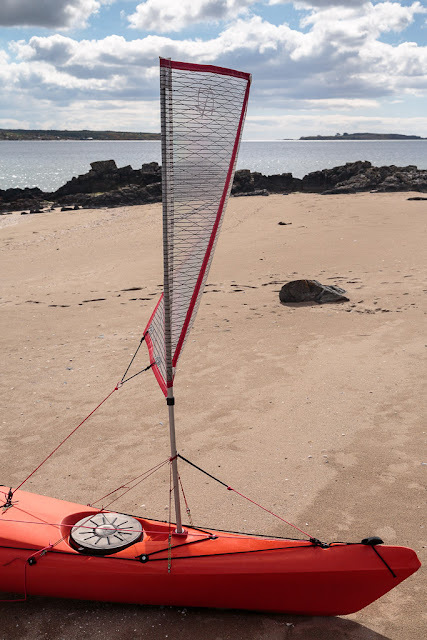 They were already developing a design based on a sail Rob had had made for him some years before, by by another sailmaker, for some big expeditions and would I mind keeping it quiet until he (Mick) had some decent prototypes made? Unfortunately (and only a few weeks later) Mick circulated his friends with the news that his "bit tired" was actually a serious illness (from which he died only a few months later). This new Footloose sail is undoubtedly the sail Mick was referring to and you can read what Rob Mercer says about its history and development here. Rob's expedition sail was a two batten, three panel sail that had been made for him by another Australian, Andrew Eddy, who sent Mick drawings of the original. Mick and Rob worked together tweaking the details. 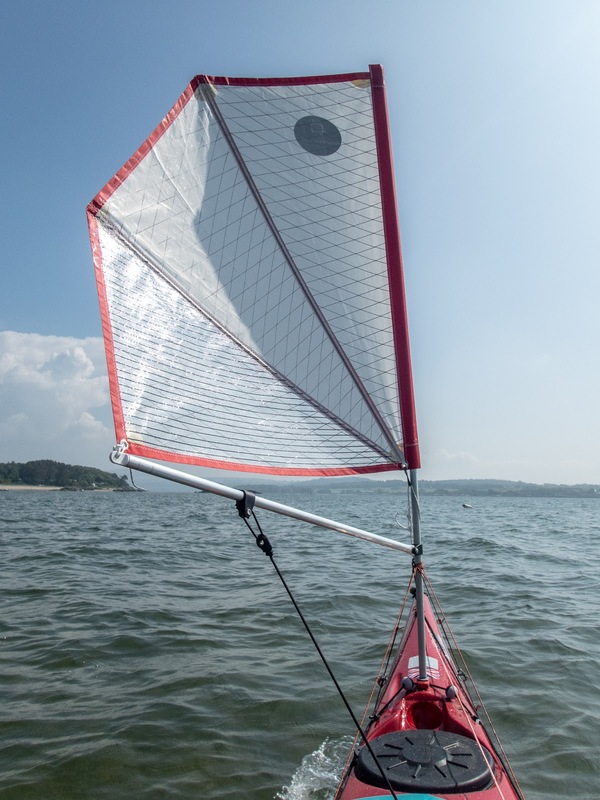 After Mick's death, Flat Earth's new sail maker, Neil Tasker, has done further work to put Mick's prototype into production. 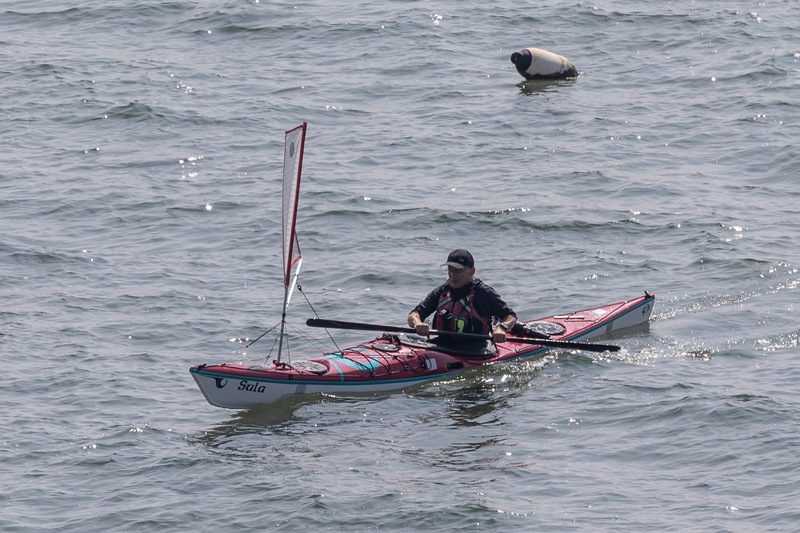 Rob has already used it with great success on a 2018 crossing of the Bass Straight. Well after that test, my few words will be pretty insignificant... but here goes! 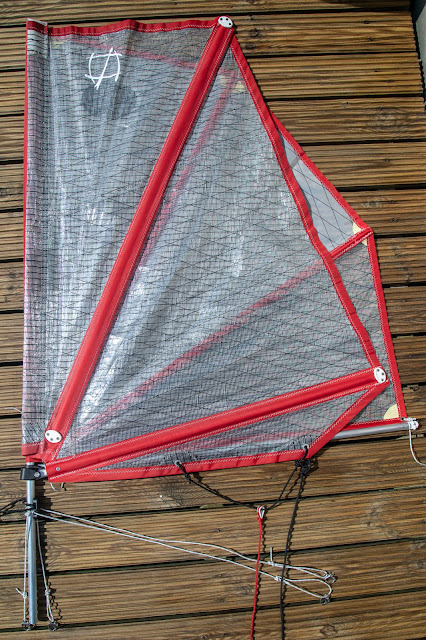 As you can see the Footloose '80 sail has two battens and a relatively low aspect. It is constructed with modern lightweight sail cloth laminates and uses a semi transparent bottom panel. Quality of construction is still as high as on previous Flat Earth sails. It has clearly been put together with care and craftsmanship. ...underlaid in this photo. The Footloose sail is supplied with mainsheet, uphaul/forestay and enough non stretch line to have two side stays and two back stays. 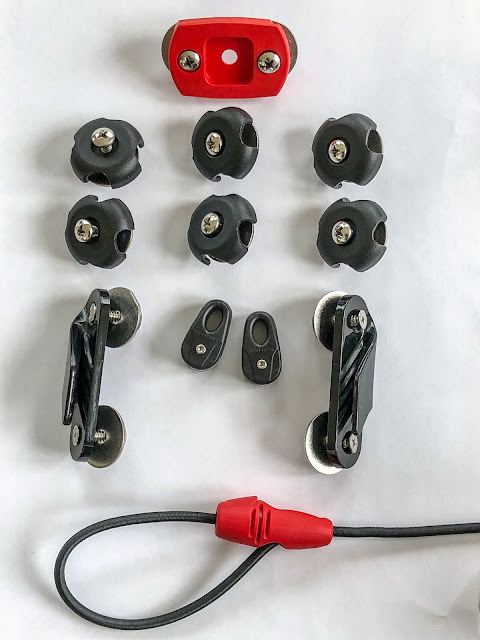 The quality fitting kit is up to Flat Earth's usual excellent standard and even comes with two extra surface deck fittings in case your existing deck fittings locations are not suitable for the fore stay/uphaul pulley or the main sheet deck pulley. The supplied mast is slightly shorter than the one I have been using with my Trade Wind 80 sail. So it can obstruct the view of the horizon. 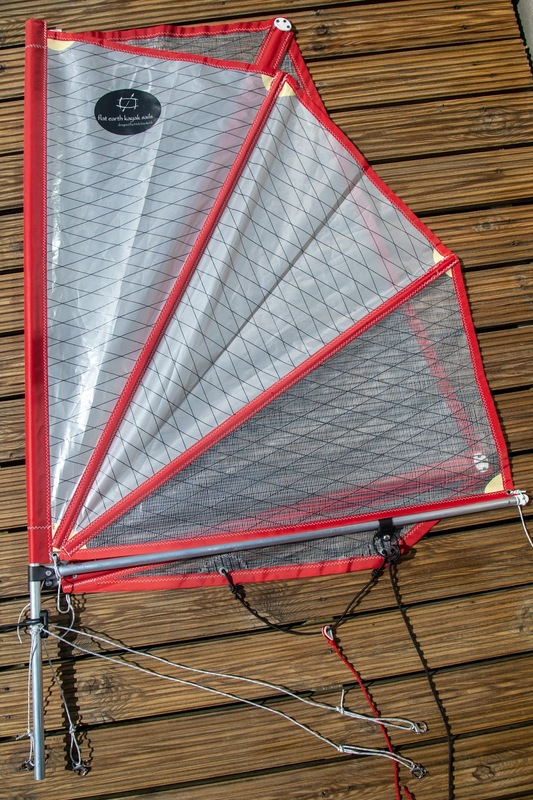 Here the Footloose '80 is set on my longer Trade Wind '80 mast. In this shot I am also using the longer Trade Wind '80 mast and have dropped the boom so that you can see clearly that the foot is truly loose. You can also see what a nice aerofoil curve the foot adopts when it is not attached to the boom along its length. My only very, very minor criticism about the fittings is that the plastic boom fitting for the sheet is perhaps a little over engineered. ...upwind it paddle sails pretty close to 45 degrees from the wind. 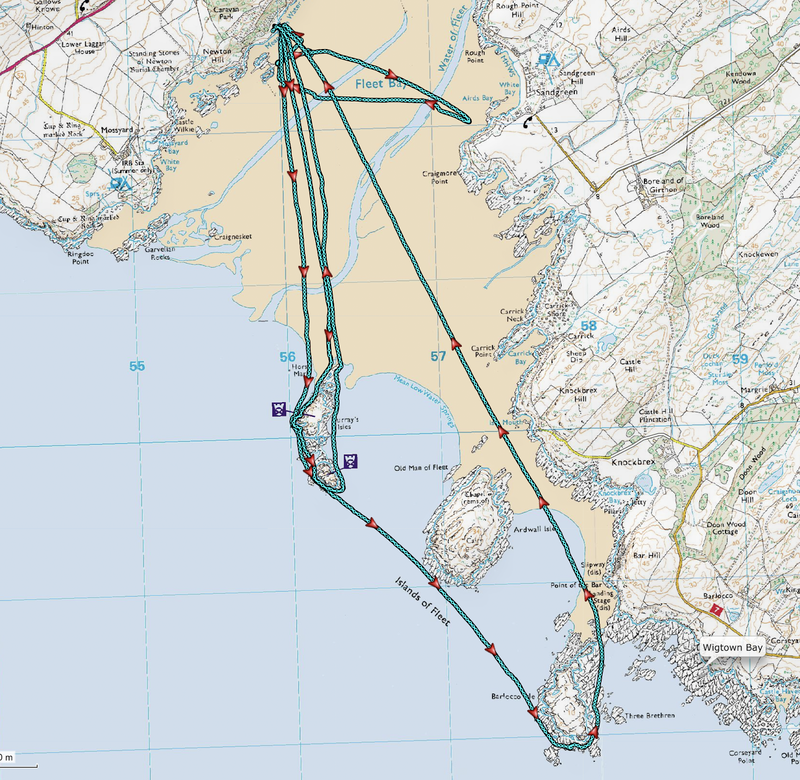 In a southerly wind and a north going tide I even managed to beat SE round the outside of the islands with the sail up the whole way (see map above). ...the top batten does not angle forward of the mast spilling wind which happens with the Trade Wind. This is especially noticeable when the boat slows down as you drop off a wave and the pressure of the following wind builds up. In the new Footloose, the leech remains tight and the increased wind pressure helps you pick up speed to catch the next wave. Note how my speed and distance covered increases on the broad reach on my trip back from the islands, as soon as I broke free of the lee of the islands, my speed increased by a factor of 3 as the sail helped me catch small swells. (The arrows are all the same time apart.) 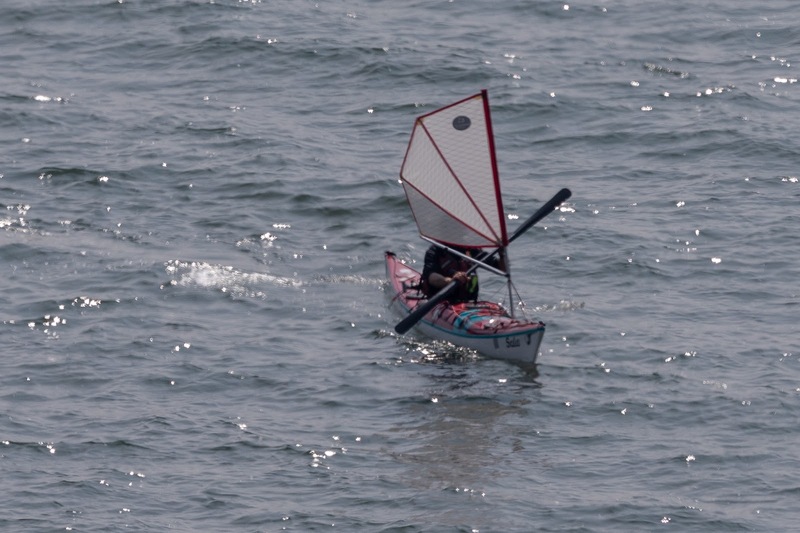 With the tight leech of the Footloose sail, I caught far more waves than I usually do with the Trade Wind sail, even allowing for my injured shoulder! The sail gybes very predictably but there a more noticeable "whumph" as the sail fills on the new side. 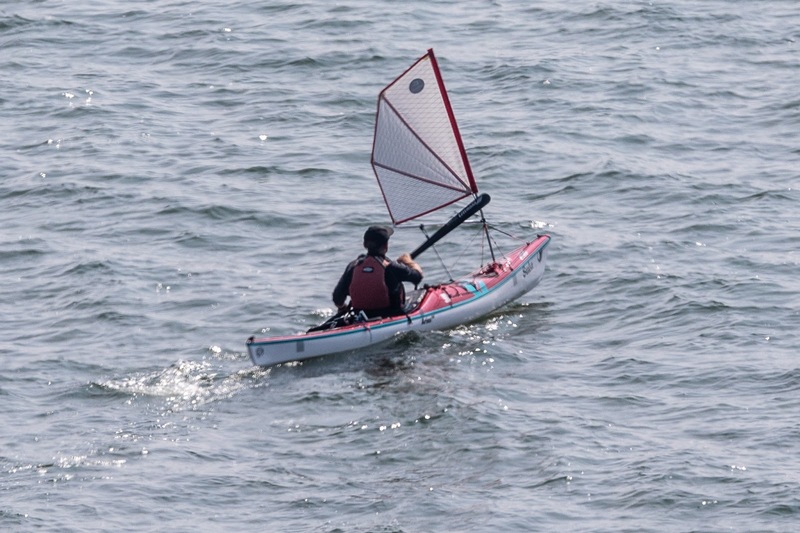 This also applies to launching the sail and it is probably easier to launch the sail on a broad reach so that the sail can spill wind as it is raised, before sheeting in. It is more difficult to spill wind when launching on a run. 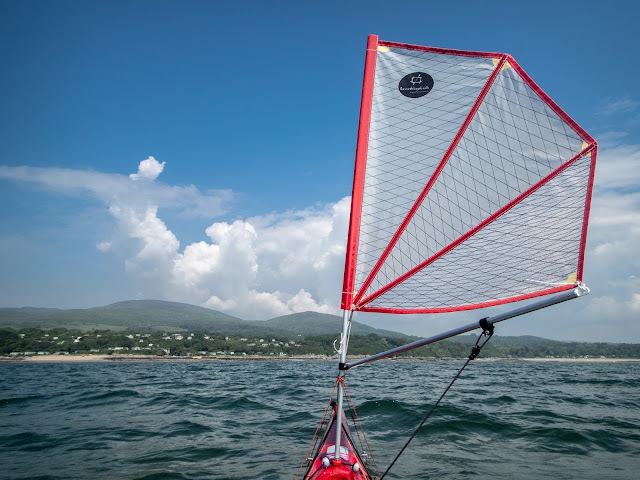 ...and upwind with the Footloose sail than with the Trade Wind sail, Experienced paddle sailors will love this direct, powerful feel though newcomers to paddle sailing would do better to look to the Trade Wind sail, which continues in production. 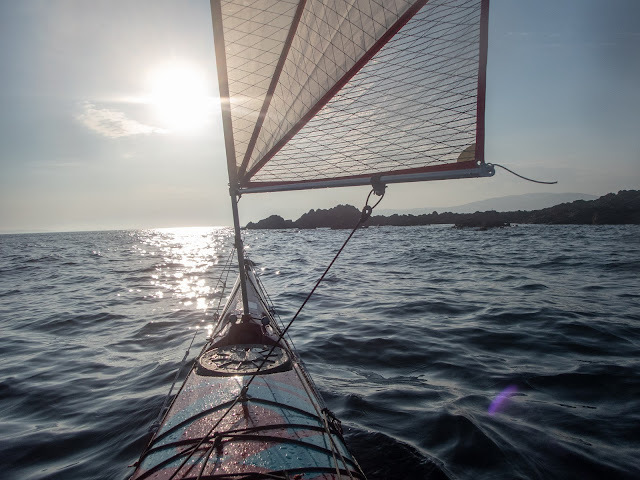 I can't wait until I am fit enough to get the Footloose sail out on a camping expedition between the Hebridean Isles! In conclusion, the Footloose is a fantastic and welcome new addition to the Flat Earth Kayak Sails range. 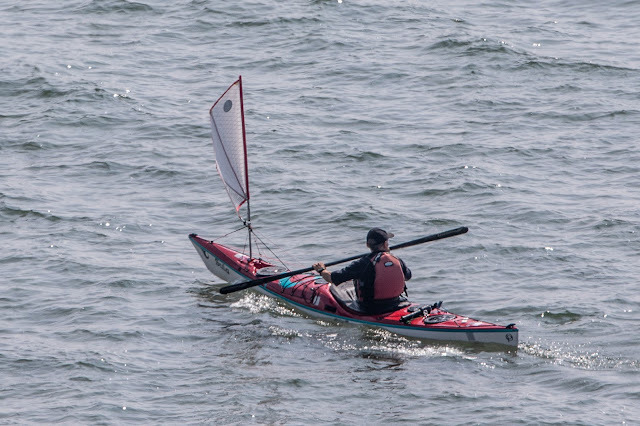 Experienced paddle sailors will love its more powerful and direct feel which really helps you catch more waves downwind. Quality of fittings and construction are to the same high standards as in the Mick MacRobb days. 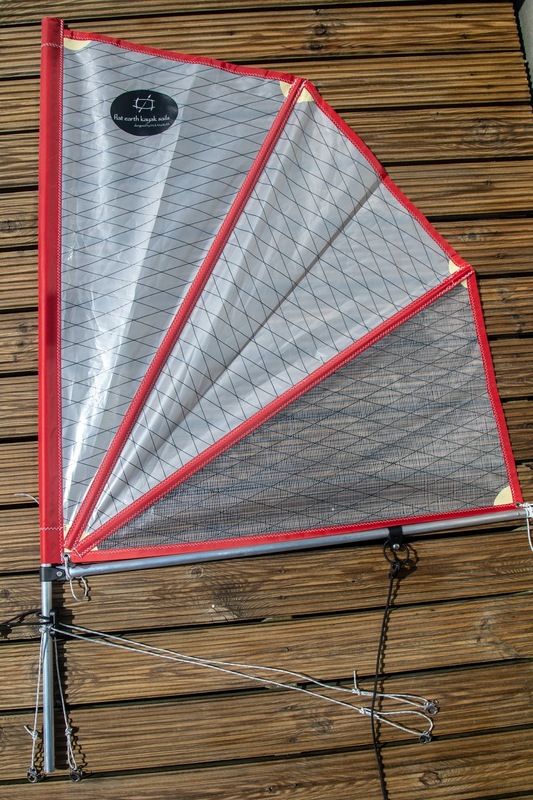 Previously I have tested prototype Flat Earth sails but this sail feels like the finished article. I can think of nothing to suggest that would improve its performance.